Yoga has been a part of my life for many years and I passionately believe in its therapeutic benefits. It’s helped me through some difficult times when I had agoraphobia, anxiety and panic attacks. I love seeing people transformed by yoga. In this increasingly frenetic world, I think we lose touch with the earth and natural rhythms of life. In reconnecting with these cycles we can find harmony, balance and the stillness inside ourselves. I qualified in 2008 following a 200 hour Dru yoga teacher training course and have been teaching since then. Courses are accredited by Yoga Alliance (www.yogaalliance.org). Dru Yoga teachers must be fully insured and registered on the Dru Yoga Professional Network and Register of Teachers, and undertake monitored annual Continuing Professional Development (CPD) activities to support their teaching practise. Dru yoga incorporates soft flowing movements, directed breathing and visualisation. It works on body, mind and spirit—improving strength and flexibility, creating core stability and building confidence to make you feel better about yourself. And it’s designed to be practised by people of all abilities, all fitness levels and all age groups. 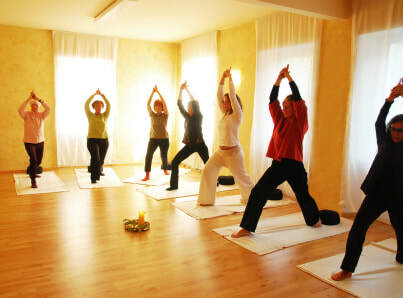 Dru Yoga is a long established yoga school with a broad International presence. In 2018, the International School of Dru Yoga has reached 40 years of age!